Samsung Galaxy y s5360 is one of the Low budget Android Phone and comes with feature of Android Operating System. Android does’t allow us to access system file of Android Operating System. 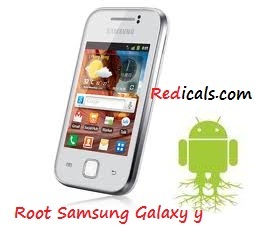 Today I will show you How to Root Samsung Galaxy y s5 and what are the Advantages of rooting Android OS. Rooting allows User to gain access to the Root or to attend Privileged Control. After Rooting we can easily Customize your Phone and can Install Custom ROM to increase Performance. NOTE 1:- Be Sure that your Phone is fully Charged because Rooting consumes more Battery during Installation and if your Battery is Low this may cancel your Installation. NOTE 3:- Enable USB debugging Goto Settings–> Application–>Development–>Click on Check Box to Enable . NOTE 4:- Rooting Your Samsung Galaxy y will avoid Warranty but you can also Unroot Your Samsung Galaxy y to make use of Warranty. STEP1:- Download Update.Zip and Copy it to the Root folder of Memory Card (MicroSD card). STEP2:- Switch off your Mobile and Restart it into Recovery Mode using Volume UP + Home Button + Power Button Simultaneously . STEP3:- Now you can move UP and Down using Volume + & – button in Recovery Mode. STEP4:- Select Update.Zip and Root will be applied on Samsung Galaxy y s5. STEP5:- It will be Rebooted and after Goto Main Menu and search for “Super User” Application, if it is there then your Samsung Galaxy y s5 has been successfully Rooted. Disclaimer:- Redicals is not Responsible for any Damage cause to your Mobile. i already done what it says but the superuser app dint show up on my menu . why ? :'( i already rooted my device before . I must show the SperUser app on your Menu if you have successfully Rooted your Mobile…try it once again….